Bio of Gary H. Price, Ph.D. I'm a country boy from northeastern Oklahoma County, raised on a farm, the more productive half of which is now submerged under Arcadia Lake. As a young boy, in a large family, there was little cash available for toys, so I was compelled to make my own from the materials at hand. I whittled some pretty fair copies of Colt .45 automatic pistols, Single Action Colt revolvers, chess sets, and so on. Wood has been a medium for artistic expression or practical construction in my family for generations. My mother, Kathryn Statham Price, was a gifted musician who played string bass and piano at Classen High School, from which she graduated at 16; she was staff pianist at WNAD radio in Norman during her studies at the University of Oklahoma. She graduated at 19 with a B.A., majoring in Latin with a minor in German. She was my friend and source of staunch encouragement. Country music had a special attraction for me in the early 50's, the heyday of Hank Williams, Hank Snow, Johnny and Jack, the Louvin Brothers, Roy Acuff, Merle Travis and many others. I would lie awake late on Saturday nights listening to the Grand Ole Opry after the family had gone to bed. Like a lot of Oklahomans of their generation who were educated, my parents had a somewhat self-conscious aversion to anything that smacked of Dust Bowl migrants (our migration to California was in 1945, also for economic reasons) and were not happy with my choice of music. I guess they got over it. Mother did, anyway. During my college days I was exposed to folk music, then booming, first through the Wayfarers, a folk trio similar to the Kingston Trio but superior in vocal and instrumental ability (Mason Williams, Billy Cheatwood and Baxter Taylor). From 1960 to '63, I played mostly club dates as a single folk act. In 1964-5 Bill Caswell, Byron Berline, Frank Deramus and I were the Bluestem Boys, Friday night regulars on KOCO-TV's Oklahoma Jamboree, headlined by Wiley Walker and Gene Sullivan (of "When My Blue Moon Turns to Gold Again" fame). With Curtis Davis and the Brushy Mountain Boys, there were several live show, radio and TV appearances. Two of my brothers, Joe on mandolin and John on guitar, joined me for a taped weekly radio show in Stillwater in 1966. About 1970-1, Price, Penland and Blair (Bill Penland, banjo, and Odell Blair, mandolin) were active around Oklahoma City. I met Tom Uhr, from Irving, Texas at Hugo in 1970 and established a musical chemistry that has endured for quite a few years, although we don't get together often. I played with his band, The Shady Grove Ramblers, in '70-1, then again '78-9. One memorable experience with that band was a show where we served as the backup band for the great fiddler, Chubby Wise. Tom's a gifted songwriter and one of my favorite rhythm guitar players. Then Albert Brown (mandolin), Jim McGehee (guitar), Jody Price (bass), Bill Reser (fiddle) with me on banjo made up the Deep Fork Drifters and played Oklahoma and Kansas festivals. So, I tried to play the guitar, then the banjo, then had to learn to fix them; that led to the attempt to build in the 60's and early 70's. There weren't a lot of good banjos available in those days. While I was working on a Ph.D. in biochemistry at the University of Oklahoma in March 1971, I designed the Price banjo with a unique reverse double-cut peghead and a new inlay pattern rather like the familiar hearts and flowers in arrangement, but all original. The early ones had handmade 6-ply rims. 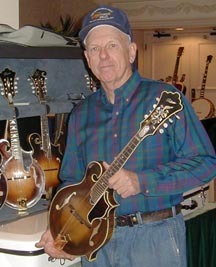 The first A-model mandolins were made in College Park, Georgia while I was assigned to the Third Army Medical Laboratory at Fort McPherson. While I was living in Georgia, I commuted to play banjo with Bill Box and the Dixie Drifters at a number of midwest festivals. At Knob Noster, Missouri, Bill Monroe hired Box to sing lead and play guitar and his son James hired our fiddle player, Smoky McKinnis; bass player Billy Brittain and I went home. At Hugo in '73, I sadly told Jimmy Martin I owed the Army too much time to join his band, but was pleased that he had offered the job. Bill Box called me sometime in 1973 or so and told me he would be in Rosine with Bill Monroe and the Bluegrass Boys for the dedication of Uncle Pen's grave marker, and asked if I'd like to come up and visit. So, I drove up to see him, and Hylo Brown was there. There was a stage program put on in association with the dedication, and Hylo didn't have a banjo player with him. He asked Monroe if he knew a banjo player he could use, and Box told him I could handle it. So Hylo asked me to play the show with him, and after we got off the stage, offered me a job travelling with him as one of the Timberliners. Once again, I had to turn down a chance to play professionally because of my military situation. In 1974 I was reassigned to the Army Institute of Surgical Research in San Antonio, Texas. During my stay there, I was afforded the use of Rolfe Gerhardt's Unicorn shop, where I built some banjo necks and my first fern F-5 copy. There was a wealth of banjo talent in Tamale Town at that time, to my surprise. Bill Holden, ex-Bluegrass Boy and Country Gentleman, was there; teaching legend Janet Davis; Winfield banjo champion, Mark Maniscalco; Jeff Large, one of the best Scruggs style pickers I have known; Lang Scruggs, distant cousin of THE MAN, and a great picker himself; Don Van Winkle, a young man who should be better known; and .....even me. I didn't get to play much banjo in that company. Luckily, I had acquired my first good mandolin in Oklahoma City in 1971 (two, actually, a 1925 fern F-5 and a 1923 Loar; no, I don't have either one anymore, and yes, I could kick myself) and made a decent copy, so I played mandolin with SouthWind (Bill Holden, Lang Scruggs sharing bass and banjo duties, Tom Holzen, rhythm guitar master, and me). Later, after Tom left to do nose jobs in Nashville and Bill Holden off to rendezvous and throw tomahawks, I hooked up with the Winkler brothers, Larry and Jack, and Jeff Large and fiddler Joe Nixon in American Tradition. That band won the band competition at the Hugo festival in 1983, I believe it was, and placed second at Kerrville to the TVA from San Antonio. In 1984, after getting rich very slowly as a luthier, I went back in the Army, did the other seven years running the clinical laboratory at Madigan Army Medical Center, got involved in computers and database programming, fulfilled my service rifle passion with award of the Distinguished Rifleman designation in 1984, played banjo for six years with GloryBound, a Tacoma, Washington old-time Southern gospel trio backed by drums, piano, electric bass and the banjo. High voltage and some fine vocals. Did some prison ministry with them, some elk hunting, fell into the Hoh River, lots of stories out of that connection. We recorded one album on cassette, which I still actually enjoy hearing from time to time. Recently, the cassette was remastered and a CD made from it. I may be able to get a supply of these. After retirement, I spent a year with the Oklahoma State Bureau of Investigation (basic police academy at 52 is very interesting) and then figured out that all those years with the Army had filled my quota of bureaucratic frustration. So, I built a metal 1200 square foot building and went back to making things (most recently jazz guitars), which is what I really love to do anyway. Lately the focus has shifted to production of top quality fiberglass cases for acoustic fretted instruments. I have a lovely wife who has suffered my pecularities for 34 years now, two daughters and a son; the two daughters have produced beautiful grandchildren, Leslie's are Christin, Micah and Paul, and Lisa had Taylor, Shannon and Sarah. At last, Michael and Kim have done their part and brought forth Davis Michael Price, in 2002, Jackson Charles Price and in 2004, Emilee Ann Price. Lillian and I have enjoyed a relationship with Jesus since 1983. Didn't mean to write a book, but you don't have to read it if you don't want to. You don't even have to believe it if you do read it. Oh, if you are a ham, I am K5VEL and hope to get a tower up one of these days, actually, I have one section left to raise, then put the antennas up. Built a new ham shack in the corner of the RV barn summer '07, getting ready for the bands to improve. I sure wouldn't take a million bucks for what I've gotten out of music.